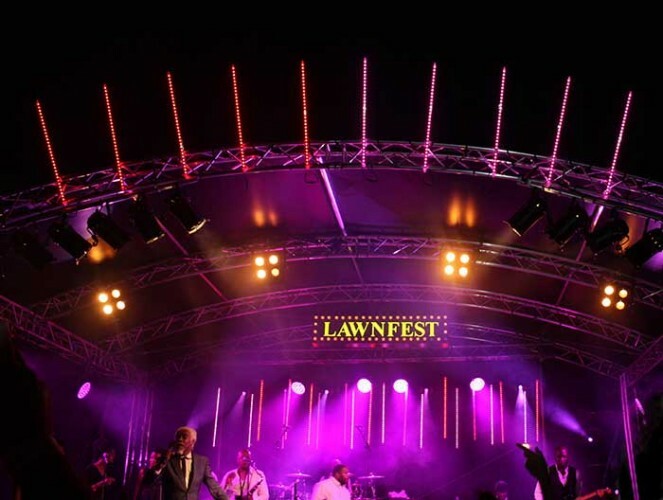 Every year Lawnfest is organised by Camilla AlFayed for the AlFayed Charitable Foundation to raise funds for West Heath School. The one-day festival showcases a mixture of raw unsigned talent and big-name acts and was headlined this year by Billy Ocean. SRD Group in Kent was asked to supply a unique lighting effect to add height, depth and texture to the stage. To do this they purchased 30 1m LED tubes from MilTec (UK) Ltd. The tubes were used in two locations: 10 were mounted on the curved roof of the stage, fanning out vertically to add height, and 20 were hung vertically at the rear, forming a curtain of light. The tubes were pixel mapped onto an Avolites Pearl desk and used throughout the day to complement and enhance the stage lighting. Colin Umbers, project manager for SRD said: "The customer had a clear idea of the effect that was required but the original plan turned out to be very expensive. I contacted MilTec because I had seen their 3D tubes in a local installation and we organised a demo. After the show, the organisers commented on how bright and effective they were, showing up clearly even during the daylight hours of the show."